Do you need music for a chakra meditation? If so then you’ll find our royalty free chakra music is perfect for your needs. In fact, this music collection is perfect for any time you need relaxing background music that will sooth and inspire your listeners. This music also makes a wonderful accompaniment to any type of natural therapy or healing practice that focuses on energy clearing and balancing. Our royalty free chakra music is available as a complete collection or as individual tracks. 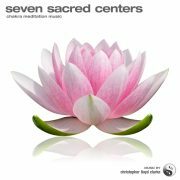 Did you know: This album (Seven Sacred Centers) is one of Christopher Lloyd Clarke’s most popular creations and features one of his most famous tracks – “Divine Love”. We hope you love this delightful music! An exclusive collection of chakra music of unsurpassed creative depth and production quality.